Do something different this winter and explore Tasmania during the day and play at the unique Dark Mofo Festival at night. Sanford is offering a land or sea package to get you there. Dark Mofo, is the Mona Art Galleries winter music and arts festival running from 7-23 of June 2019. An enchanting festival located in Hobart. Mona Galleries winter wonderland is a festival with plenty of exhibitions, food, art, film, musical performances and incredible light displays to be explored. A public art playground with artists performing around the city, including historic Odeon Theatre and Federation Concert hall. ﻿Return economy airfares with Virgin Australia from Sydney to Hobart. 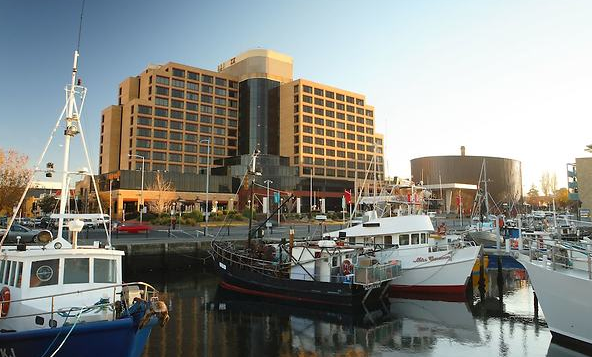 6 night’s accommodation at the Hotel Grand Chancellor (as shown above) in a Superior Harbour View Room. Port Arthur, Richmond and Tasman Peninsula Day Tour – includes a guided tour of the historic Port Arthur site, photo stops at the Devil’s Kitchen and Tasman Arch. As well as time in the village of Richmond. Bruny Island Gourmet Food & Wine Day Tour – Experience the spectacular landscapes and gourmet local produce on this full-day tour to Bruny Island. Moorilla Wine meets MONA Art Tour – Includes return ferry from Hobart to MONA, MONA entry, Guided vineyard and winery tour, lunch with glass of wine and tutored wine tasting. City of Hobart Dark Mofo Winter Feast: Offers a contemporary take on a medieval-style banquet. Dark Park: Follow the neon lights around this public art playground. Museum of Old and New Art (Mona): Described by its owner as a ‘subversive adult Disneyland’. Mona is home to one of the most controversial private art collections around the world. 6 night round trip cruise onboard the Pacific Explorer (X933) departing from Sydney on 18 June 2019 calling in Hobart for two nights. Return ferry ride and entry on 1 day to Museum of Old and New Art (Mona). Priority pass on one night to the City of Hobart Dark Mofo Winter Festival (food and beverages not included).